Pocket gophers are a small rodent which appears in many states across America. Called “pocket gophers” because of pouches which are on each side of their mouths, these animals are often times mistaken for a rat, a chipmunk, a woodchuck or a squirrel. They are quite possibly the most common mis-identified animal in the United States! Pocket gophers have small ears, barely noticeable, large incisors which constantly grow and forepaws which are big and clawed. Gopher incisors grow outside their lips so they are able to close their mouth all the way and are able to chew without getting dirt in their mouth. The front of their body is both strong and agile; gophers can move backward in their den about as rapidly as they can move forward! All these adaptations allow these animals to thrive wonderfully under ground. Since gophers don’t have a keen sense of smell or sight, they rely on their whiskers to “feel” their way around. Though thought to be nocturnal, gophers are on the move most of the day. Even though it may be bright and sunny outside, it is always dark where gophers spend their time. There are over 30 species around the world and over a dozen which reside in the United States. Most are in the western part of the country but the south has a species as well. Most common in the west are the Northern Gopher, the Botta Gopher, the Plains Gopher, the Desert Gopher, the Texas Gopher and the Yellow Faced Gopher. The south has the Southeastern Gopher. Most are around six inches to two feet in length and can range in size depending on species, food supplies and type of habitat. Pocket gophers vary greatly in color; because they don’t migrate and stay close to where they were born, colors can be quite different even within a state. A wide range of environments can support gophers. They have been found at altitudes over two miles high as well as low coastal regions. However, they don’t do good in areas subject to flooding. There is also a direct relation between soil type and tunnel structures. Shallow soils are more likely to cave in so sandy soil forces gophers to tunnel deep. The moisture at deeper levels will help to hold the sand in place which is needed to support their tunnels. Light textured, porous soils are also good at releasing gases so they are generally preferred over hard clay which is difficult to move. Tunnel depths will also vary depending on temperatures. In areas where there are hot summers, expect to find them both deeper and more protected. Interestingly, there is very little crossing over of species throughout the United States. Though well over half of the states have one species or another, it is most common to find very distinct borders dividing species and though some hybrids surely exist, species have been able to keep themselves distinct. This is due in large to their reproductive and common day to day activity. Pocket gophers will usually only have one living in any found tunnel system. If its a male, he will constantly be looking for females. Once he finds one, he will mate and return to his domain. If a female resides in the burrow, expect little ones sometime in the future. These tunnels usually have a main burrow, which is close to a surface mound, from which all other tunnels leave. The main burrow is generally 1-2 feet deep but it will be deeper if soil conditions warrant such placement. Mounds are the raised dirt piles created by all the digging gophers do. Though one main mound exists, more will rapidly appear once the animal gets established and determines it wants to stay. From this time on it is not unusual to have more than a mound created every day! It has been determined that gophers can move over two tons of soil each year and some populations in the southeast have been found to move over 50 tons of dirt in just one acre!!! And even though it may snow in your state, don’t think this will slow them down. In fact, gophers are active year round. They don’t hibernate and continually need food so they will readily burrow through snow attempting to find food. Needless to say, this burrowing causes a lot of damage and though some will argue it is good for aeration and soil reconditioning, many times this activity leads to broken pipes, breaks in flood control dams and reservoirs and damage to existing foundations and structures. Though mound building and tunneling may be more active in the spring, it seems to be equally as active in the fall. Male burrows seem to have more tunnels – most likely created while attempting to find females – and abandoned tunnels and burrows will readily become occupied by any gopher close by looking for a place to live. Pocket gophers will reach sexual maturity in the spring following their birth. Most species will have two litters a year with anywhere from 4-10 per litter. Densities per acre seem to be related most to food supply and local soil conditions. The better soil and more food available areas will have more gophers. Over 50 per acre have been found with more than 60 in some areas where both soil conditions and food supplies are good. They will live 2-5 years on average with some being able to live over 8 years if conditions are right. Though gophers have a list of natural predators, there is no one animal which appears to like a gopher meal more than a badger. Skunk, fox, coyote, snakes, cats, dogs, bobcat and several birds of prey will feed on gophers, but badgers seem to be best built for a gopher meal. Once they find a gopher mound and tunnel, a badger will dig and dig to get the reward. Their strong fore legs enable them to dig as deep as they want and it is not uncommon to find huge areas dug up where a badger has stubbornly worked to get a meal. It almost appears as though the reward could not have been worth the effort for when a badger displaces hundreds of pounds of dirt for an animal which may not weigh a pound, one has to wonder. However, this scenario has played out over and over and I suspect it contributed in part to why the badger got it’s name. Other predators may not fare so well. Though coyotes and skunk will dig a little, they are not prepared physically to endure the wear and tear their bodies will incur trying to dig out a gopher. Snakes may not do much better. Pocket gophers will readily stop up a tunnel while facing a snake, open it’s mouth and form a shield of sorts with it’s teeth. Other animals, like chipmunks, lizards or squirrels will leave a tunnel once a gopher has been found to live there. The damage caused by gophers can be extensive. Though tunneling and burrows can cause flooding and damage to structures, gophers are most known for the damage they do to plants. Many homeowners have had a gopher move into their yard only to find it eating anything and everything it could find. Pocket gophers need a lot of food to sustain themselves. They will eat a plant any which way they can. Feeding will occur under ground, at the base of the plant, on it’s roots. Feeding will occur above ground when plants are located close to the main mound of a local gopher. Feeding will occur as gophers tunnel to the base of a desired plant where they will surface, cut the plant down quickly and feed on the most nutritious part leaving behind most of the plant in tact – except it is dead. When roots are fed upon, the plant may die a slow death not seen or noticed above ground until it is too late. Bulbs, vegetables grown underground and fruit ripening within the reach of their tunnels are all subject to damage. Farmers suffer more. Not only do gophers do more damage to crops annually than almost any other animal in the Midwest, because their mounds can get so large they have a huge impact on farm equipment. The raised dirt will dull the blade of many sicklebars and control measures are not easy at such a large scale. However, there are a lot of options available if you need to control a local infestation. Keep in mind that where you have had a local population established over a period of years, you will not be able to use any one device and get control. Expect to have to employ a few of the control options the author is about to list. If you have a yard, flower bed, garden or crop area that is situated close to where gophers are either active or living, they will find their way to your property. Though you may be lucky for a year or two following a newly constructed home, the very same things which will make your yard complete will attract gophers. For this reason, it may be wise to set out some type of repellent. There are several available all of which can provide a first line of defense that may keep them out. If you discover a gopher has just begun to tunnel in your yard, these same repellents may be enough to expel him before he or she gets established. There are two liquid repellents which can make your yard seem unattractive to gophers. The first is the use of COYOTE URINE. By installing this along property lines which are most likely to filter gophers into your yard, the scent can and will alarm the intruding gopher to danger. It is best to pour it out where you expect gophers may enter your property; since gophers travel under ground it is suggested you try to “draw” a line which in theory will be detected by the gopher as it forages. Once it smells the danger it will move on to safer areas to feed and live. Since the urine is subject to rapid breakdown from rain and water, the use of LIQUID GUARDS can extend the life of the urine a lot. Install the Guards every 10-15 feet along property lines where gophers are likely to enter. Still pour some on the ground as well; the odor emitting from the Guards will keep the scent in the air and have far reaching impact. Remember, the smells from your yard which attract gophers in the first place can be replaced by smells which will scare them. Coyote Urine in Guards will provide such an odor. If you have just discovered a gopher digging and setting up a home in your property, the use of Coyote Urine may be enough to make it move on. Put some around the plug on it’s mound. Dig up some of it’s tunnels and apply some there as well. This will lead the gopher into believing it is being hunted and will either move out or stay if if feels there is simply too many good things in your yard to leave. If this happens, you will have to resort to some of the baiting or trapping which will be detailed later in this article. (Treating mounds and tunnels with coyote urine once you trap or kill existing populations is a great way of keeping new ones away. Since vacant mounds and tunnels are highly pursued by mobile gophers, as soon as you remove one others will want to move in. Treat main burrows with the urine and establish a scent barrier to help keep these unwanted guests out. Another liquid material which works well at keeping gophers out of your yard is WHOLE CONTROL. This material tastes terrible and though gophers don’t eat the soil they dig through, burrowing and tunneling will cause them to taste enough of it to chase them off. The key to successfully using this product lies in the depth at which gophers are digging. Since you are applying the Whole Control on the surface of the soil, it will only penetrate a foot or two. If you know your gophers are digging more than two feet down, it will be hard to get the Whole Control deep enough to have a big impact. However, it is easy to apply over large areas and is sure to stop new ones from entering particularly these foraging gophers tend to travel up near the surface. Since many gardeners experience damage done to their plants and in particular, certain species at different times of the year, spraying the plant or it’s roots during planting can stop this from happening. Use ROPEL and spray the root system of any flower, tree or shrub you suspect may attract gophers just before you plant it. Ropel will not hurt the plant at all. Instead it coats the plant with a terrible tasting agent that gophers will avoid. You can also spray bulbs before planting. Treatment won’t last forever, but certainly a month or two depending on local weather conditions. This application can prove to be all you need to do so as to insure your work won’t go to waste. By making any plant unappetizing to the gopher you force it to look elsewhere for food. This changing of the gophers behavior will cause it to “forget” your plant was ever there. Ropel also works great for treating inanimate objects as well. Pipe conduits, fence rows, water pipes, pvc or metal all can be treated prior to placing in the ground. Remember, gophers need to grind their teeth. Since their incisors are constantly growing the need to grind them down is important or else they risk dying from having them grow too large. Because of this need gophers will look for select hard items on which to gnaw. 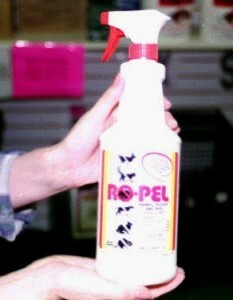 If you have something they want, treating it with Ropel will stop them quickly. It tastes terrible and can be sprayed directly on whatever it is the gophers want to chew. Be sure to spray anything you are replacing due to gopher damage. Even trace amounts of Ropel are effective and by making their target undesirable, your problem gopher will have to go elsewhere to chew. There is another tool you can try to implement which does work well at preventing gophers from coming around. It has long been known that Barn Owls will consume gophers on a regular basis. 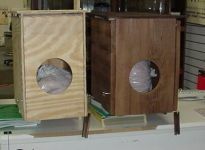 If you have this species of Owl living in your region, you can install a specially built BARN OWL BOX on your property. Once installed, the hope is it will become inhabited and that the owls living there will prey upon local rodents like gophers and keep their numbers minimized. Though the impact by owls can be significant, don’t install a house and expect to have owls living there immediately. Our boxes are built to attract owls but in most cases it will take a season or so before you get any living in one. This is because owls are only looking for a home in the spring. There will always be exceptions to this but don’t expect much to happen in the first few months of installing an Owl Box. If you have active gophers you want to control, you will be better served following one of the control methods listed below. However, installing a Barn Owl Box is both beneficial to the species and aesthetically attractive in any yard. Repellents are good at keeping pocket gophers away and may even chase a newly active one off your property. But if you have an established population, repellents alone won’t solve your problem. For large areas that have active pocket gophers, you will need to bait and trap. Baiting will be the first step. Most pocket gopher baits available use strychnine as the active ingredient – which will kill pocket gophers quickly – but most are not formulated with attractants pocket gophers like. If they are hungry you will get some of them to feed but don’t leave it to chance. In our experience, POCKET GOPHER BAIT which uses oat and other flavorings that gophers just can’t resist. But we have also seen good results with MARTINS POCKET GOPHER BAIT so both can work. To effectively treat, you need to apply some bait every 5-10 feet along tunnel systems. This can be done by opening the tunnel with a small spoon and then sprinkling the required dose, generally about a tablespoon, down the hole. The bait will be found since most gophers will travel the length of their tunnel system at least once each day. You want to treat as many of the tunnels that you can, however, to insure they will find it. Since gophers will seal any entrance or weak spot along their tunnels, areas where bait has been applied are likely to receive some attention which many times covers the bait you applied. By making several placements you insure at least one will be found. Now if you have open dens and tunnels with holes, it would be wise to get some bait applied down these entrance points. But don’t be careless with bait by sprinkling it in open areas subject to weather and non target animals like dogs or worse yet, children. Use a SNAKE BAITER to place the bait down 2-3 feet. This device is easy to use and will help get the bait placed down deep in the tunnel which will help with quicker acceptance and less chance of it getting noticed by some animal above. Expect the bait to be consumed and gophers to start dying quickly. Though most will die in their burrows, some may come out and expire. The left over bait will be active so as new gophers find their way into vacant tunnels they will find the offering and die. Though applying the bait by hand may not be too time consuming, it can become a lot of work if treating 1/4 acre or more. Once lot sizes get over 10,000 sq/ft, you should consider getting our BAIT APPLICATOR. This rod like device is used by poking it through the soil into the tunnel and releasing some bait. Use of the baiter is both easier and less time consuming – particularly when you have to treat a lot of tunnels. All you need to do is poke the rod through the ground to the tunnel and turn the bait release crank. A premeasured dose will drop into the tunnel insuring proper placement, easy application and no major damage to sensitive tunnels. If you reside where the soil is hard, be careful and sure not to damage the Bait Applicator by forcing it down in the ground. Get a TUNNEL FINDER for help in locating tunnels when trying to bait solid and dense turf. It’s designed for hard pan or dry, clay based soil and won’t break – even when forced into the ground. Using this tool to find the exact location of any tunnel will help reduce needless wear and tear on your applicator. Furthermore, the Tunnel Finder will help by creating a “pilot” hole so the Applicator can be inserted that much easier. This will enable you to make precise placements which are evenly spread out – an important key to successful baiting. Though baiting will kill the vast majority of active gophers, it very rarely kills all of them. This will happen for many reasons including bait shyness, a lack of interest in the bait offered or simply by missing the bait altogether. Regardless of the reason, if you still have gophers active following an intensive baiting program, you will need to do some trapping. There are many traps available for gophers but they can be broken down into two types. Kill traps and live traps. Kill traps include many models but two which work very well and for all species of gophers are the DEATH TRAP and the CINCH TRAP. Both traps do a great job. The key to success with their use is placement. First, you need to find an active mound and tunnel – preferably the main burrow. Next, open the plug hole, which is located on one side of the mound. Try to position traps on either side of the lateral tunnels coming off the main burrow. Bear in mind that freshly dug mounds usually have plugs which are only a few inches deep. Placement in new mounds seems to work best since this is where the gopher is currently active. Once the traps have been placed, plug the burrow as it was before you opened it up. Most trappers set out traps in this fashion with the expectation the gopher will come back to work the mound area, find the trap and try to push it out leading to it’s demise. Another way to set the trap is to place it down the main burrow after removing the plug and once set, leave the tunnel open. The theory here is that you hope the gopher finds the trap and tries to push it out treating it as something foreign which needs to be displaced. Both traps work by crushing the gopher. The Death Trap is good for small gophers and the Cinch Trap better for larger animals. Be sure to secure the traps with chains and stakes so that predators seeking the gopher may steal the trapped dead animal but not your trap as well! If you prefer a LEG HOLD TRAP, they should be set in the same way as the kill traps. Place them down plug hole burrows on any tunnels coming off the main burrow. These traps will have to be chained and staked so that predators won’t steal the trapped gopher along with your trap. Traditional trappers that learned how to trap gophers are more comfortable with this design and this trap has probably caught more animals over the years than all others combined. However, any good baiting and trapping program will probably do best if more than any one style is employed. This is particularly true if you have several animals to trap. Keep in mind the leg hold trap won’t kill the gopher; once caught you will have to dispose of him by either relocating or destroying it. Another way to trap gophers is with the use of SNARES. 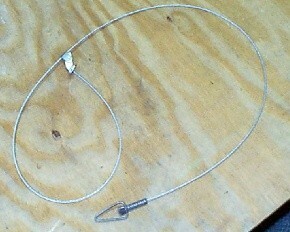 This method has become more common is the past decade because snares are cheap. However, they are tricky to set and rely on needing the gopher to come outside it’s protective tunnel system. Snaring works by using metal cables which have a noose that is able to close but not open. As the gopher enters the noose head first, the snare will tighten around the neck of the animal securing it from escape. Though snares will generally trap gophers alive, they will die if left unattended for more than a day. Snares need to be attached to stakes so snared animals don’t pull them down their dens. And don’t be surprised if you find some dug out as predators will readily retrieve a snared gopher going to great lengths to get to the animal. If you get good using snares, you may learn how to set them in lateral tunnels. This is a hard way to make a set since it requires having to work in existing tunnels without damaging them. Expect to collapse and destroy several tunnels before you learn how to make this set; tunnel snaring is best left to the experienced trapper. The reward of these sets is generally a quicker catch since gophers will move through most of their tunnel system on any given day. Strategically located snares will be entered within a day or two allowing for quick animal removal. However, improper sets can lead to the creation of a trap wary gopher and cause more aggravation than they are worth. With other traps available and the effectiveness of the baits now available, snaring has lost much of it’s popularity in recent years. 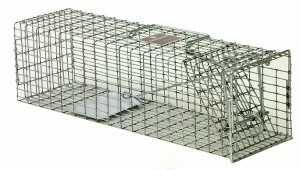 Another way to live trap a gopher is with a cage designed trap. Though hard to do, live trapping with these devices can be done. The key is in proper trap placement. Since most feeding occurs underground, it is hard to get a gopher to come onto the surface to feed. Pocket gophers will sometimes exit their burrow through plug holes, but rarely will they travel far enough to live trap them. You can try making a set at such a location but you would do much better with a set located where you know the gophers are going to feed. These locations would be at the base of a plant, a shrub, a special vegetable or whatever it is they have found on your property which they targeted. Once you determine what this food item is, use it as the “bait” to first lure and then catch nuisance animals. Your bait may be alfalfa, dandelion or some other plant in and around your yard. Once you decide what you will use, place a good amount of it in a live trap, like an LT5518, and position the trap above tunnels which lead to the desired food. Be sure to use “lead” bait from the tunnel to the trap. This will help guide the gopher to the entrance of the trap quicker since they don’t see too well. Once active gophers have been baited and trapped down to a minimum, empty and abandoned burrows will become a target for new animals looking for a place to live. This is only natural. However, you should try to prevent this from happening. The most common cause of re-infestations is the readily available housing which was created by the previous colony. There are three things which can be done to help make a den unusable and ignored. First, pull it apart. Do this with a pick ax, shovels and any other instrument which is strong enough to break apart the sometimes really hard soil which can be the foundation of any one mound. Be sure to dig down at least 2 feet and once the ground is open, fill it with as much loose dirt mixed with water that you can find. This slurry will penetrate deep regions and secret compartments which contain odors and scent which only serve to attract new gophers. By burying these smells along with the destruction of tunnels and burrows, you will minimize the likelihood of re-infestations. Be sure to not do this unless you are sure there are no active residents left in the den. If there are still some residing there, filling the holes will only make them that much more resilient and difficult to control. Second, treat the now closed up and broken apart burrow with some of the Coyote Urine listed above. This odor will alert any new foraging gophers that they should stay away. Once they get a whiff of the smell of coyote, they will fear being there altogether since coyote will regularly attack gophers at such locations. It’s just not worth taking the risk of living in any area where coyotes have been digging up mounds and generally roaming gophers will stay away. Third, if the mounds and burrows are simply too big to deal with, set out some POCKET GOPHER SOUND REPELLERS. These units are battery operated and project a constant sound down mound tunnels which are very aggravating and disruptive to any gopher. When installed properly, the sound will be able to penetrate deep into all the chambers and recesses where gophers like to reside. The sound is generally annoying enough to chase away any new gophers seeking harborage. It’s so annoying that you might be able to effectively repel some which are still living in the mound but our experience has shown us that it is best to use some of the more traditional methods first and the Sound Repellers last mostly as a way to keep new ones from coming around. Pocket gophers are a nuisance to farmers, homeowners and just about any industry which relies on using the ground for growing plants or controlling water. Though persistent and prolific, there are ways to successfully control their populations where they are not wanted. If you have them close to your property and you want to keep them out, use some of the repellents listed above. Once established, you should apply some bait and set traps to remove the existing population. Though the bait will work quickly, if you have a lot of animals in the area you are treating trapping will probably be needed. Choose a kill trap or a live trap and make a good set for best results. Once the current population has been controlled install some of the repellents to help keep new ones from entering the vacant territory. Though small and timid, this rodent can cause a lot of damage to your land, turf and plants so be sure to get control of them before they get control of you!! !